This page is for some of the rough and unpolished slabs we occasionally have for sale, such as Charoite from Russia, and a Sugilite-looking material we recently acquired. We charge one shipping cost for all that will safely fit in a Small Priority Flat Rate box and will ship to the U.S. as well as Internationally. See our Store Policies for full details. 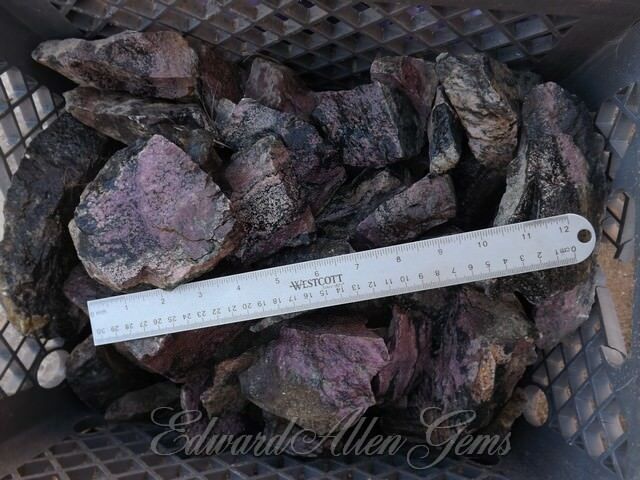 This is a slice from a beautiful purple rough material we recently acquired from an old collection. 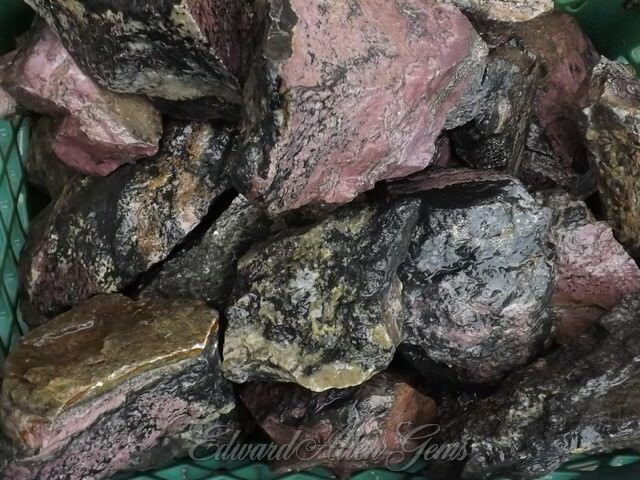 We saw an ad for 'Rhodonite or Sugilite' lapidary rough. The photos looked like a beautiful pink Rhodonite. But when we saw the material in person, it was definitely more purple, not pink. The person we bought it from said it came from someone who had worked at what once was Kaiser Steel years ago (which had been located in that vicinity). That company would import Manganese from South Africa for its steel production. 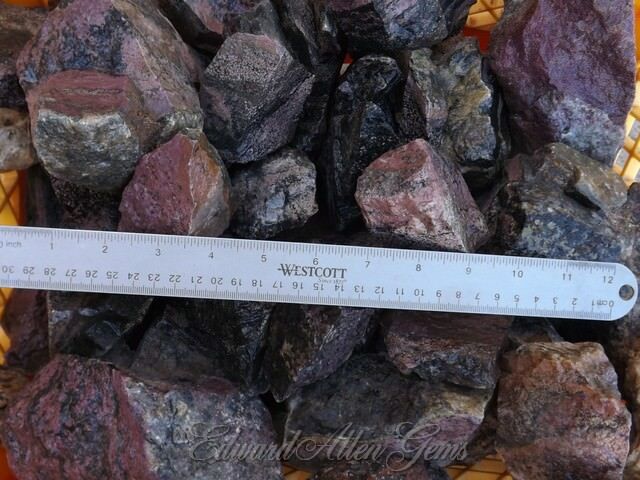 His guess was that this was a low-grade Sugilite, brought over because of the Manganese. It's hard and does take a nice polish. 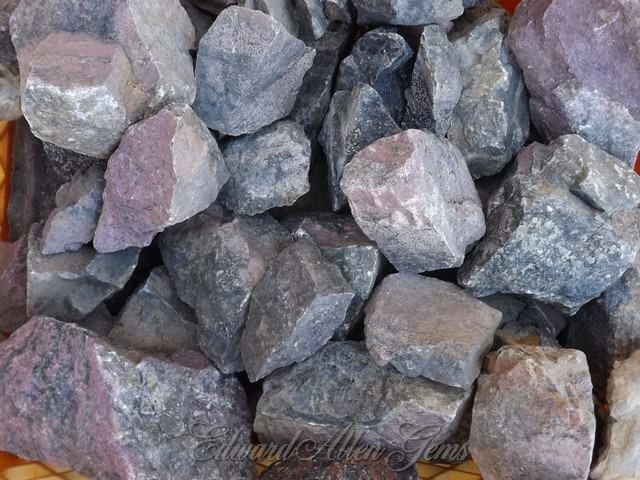 But please note - we do NOT know what it actually is, but it is a beautiful purple - some pieces are more solid-looking color, others with nice patterning and even some with tiny orbs. This specific piece is has an almost gemmy-looking section in it, some green and a number of tiny orbs - great pattern-potential! It measures roughly 3" x 2 1/2" and 6.6 mm thick. The weight is 90 grams, or 3.2 ounces. This is another slice from the material we are calling 'Sugilite-like' since we think it is probably a low-grade Sugilite. It has some really neat pattern potential in it, measuring roughly 2 3/4*#34 x 3" x 7-8 mm thick. It weighs 112 grams, or 3.9 ounces. This is slice of 'Sugilite-like' material with an area of a green mineral/matrix. The purple has tiny orbs in it. It is about 3#34 x 2 1/2" at the widest points, and a little less than 7 mm thick. It weighs 74 grams, or 2.6 ounces. This is an end piece slice of 'Sugilite-like' material with a section of the black on one end. It is a little under 4" x 3" and weighs 169 grams, or 6 ounces. 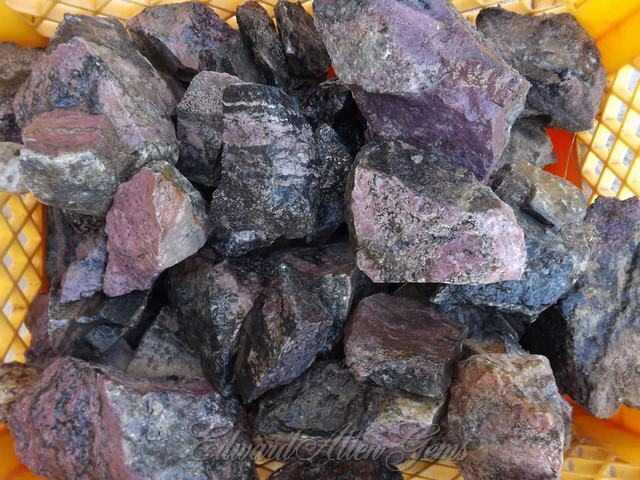 A little less than half of the slab, in the purple area, is 7-8 mm thick, with the rest of the purple and the black varying in thickness between 4-7 mm. May still be available for less through eBay auction. 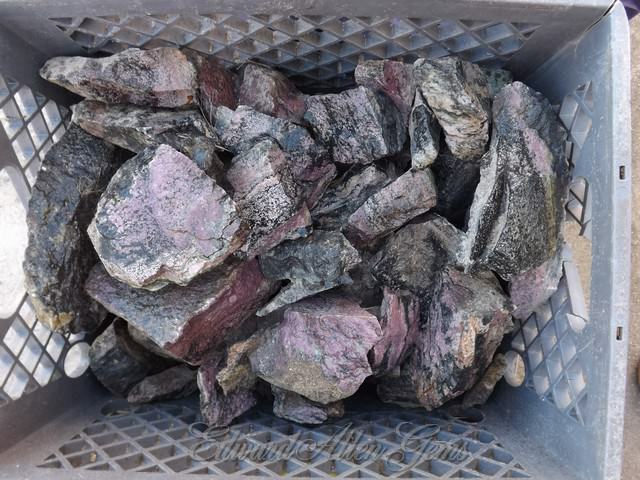 This is rough, uncut pieces of some beautiful purple rough material we recently acquired from an old collection. 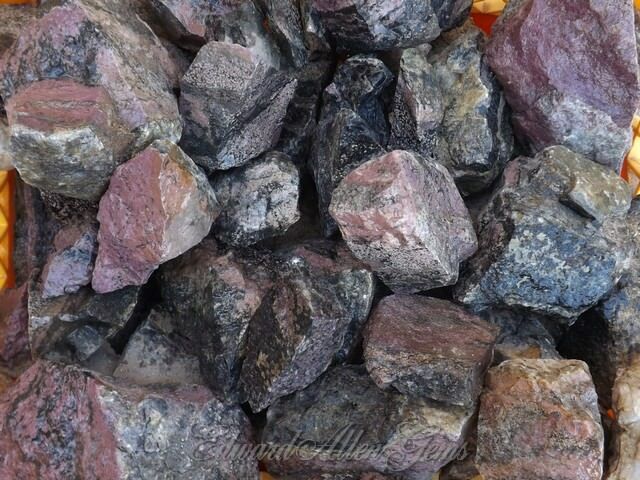 We saw an ad for 'Rhodonite or Sugilite' lapidary rough. 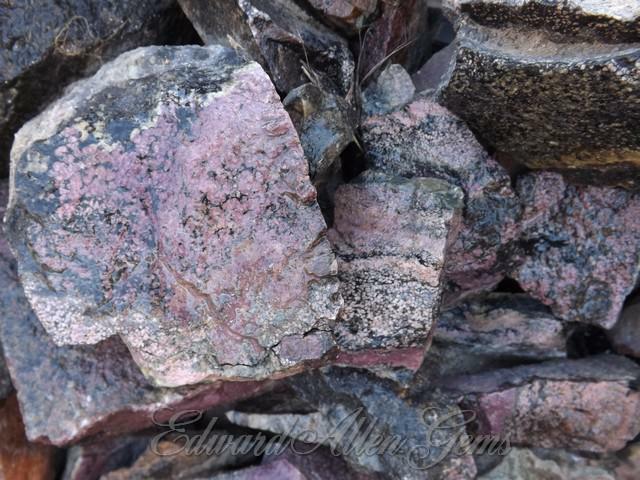 The photos looked like a beautiful pink Rhodonite. But when we saw the material in person, it was definitely more purple, not pink. The person we bought it from said it came from someone who had worked at what once was Kaiser Steel years ago (which had been located in that vicinity). That company would import Manganese from South Africa for its steel production. His guess was that this was a low-grade Sugilite, brought over because of the Manganese. It's hard and does take a nice polish. But please note - we do NOT know what it actually is, but it is a beautiful purple - some more solid-looking color, others with nice patterning and even some with tiny orbs. 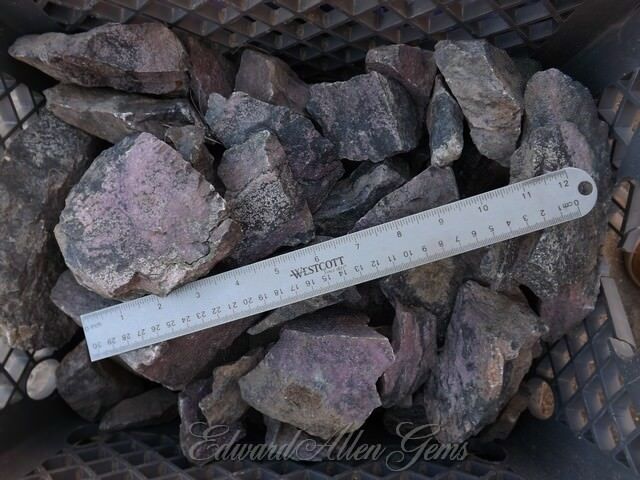 We have a variety of sizes, from as small as 2-3" one way, up to 6-8" and even a few larger. A purchase of one pound will usually give you smaller pieces, and for larger orders you would get a mix of sizes. The pieces in the photos are a good example of what you will get, but we have a lot more rough than you see in the photos. If ordering more than 3 pounds, please also select the Medium Flat Rate Box the bottom of this page.